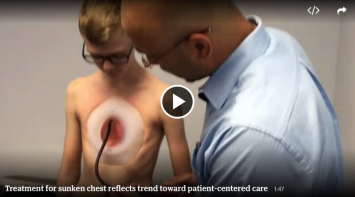 Besch’s sunken chest is due to a genetic condition the medical community calls “pectus excavatum.” It’s common, but Besch’s case is severe and it’s more than just cosmetic. He’s in the bottom 10 percent of his age group for exercise tolerance because his ribcage constricts his heart and lungs. The vacuum device was approved by the U.S. Food and Drug Administration as a medical device in 2012, but it’s considered an experimental treatment, thus not covered by insurance because of its limited track record.